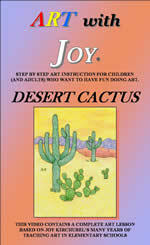 Students color or paint a beautiful desert scene with saguaro and prickly pear cacti using colored pencils or watercolors. This lesson teaches interesting facts about the Saguaro cactus. It also discusses artistic principles such as overlapping, warm and cool colors, fore, middle and background, and arranging objects to unify a picture. The lesson demonstrates painting with water colors. 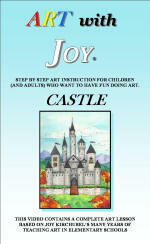 Teaches how to draw a castle i.e. ; perspective top & bottom, near & far. Teaches about castles i.e. ; the uses and purposes of various wall and towers, how inside the castle could include an entire town. 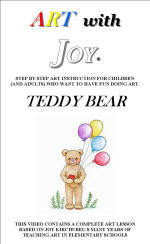 Children are encouraged to draw and color any imaginative background they like. Students draw and paint an Autumn tree using pencils, pens and water colors. 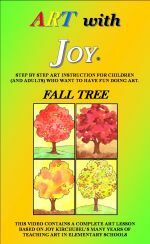 In this lesson two different ways of painting the trees are demonstrated. The foliage is painted with dots for younger children, and free form color for older students. The lesson reviews painting with water colors, painting the sky and warm fall colors. Painting with watercolors - Placing flowers freely on the paper. Watercolor techniques i.e. ; creating light and dark shades of color on flowers and leaves, painting one color next to another. Visualizing and creating one flower behind another. 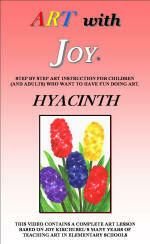 Teaches the basis of painting with watercolors while designing a beautiful red flower. 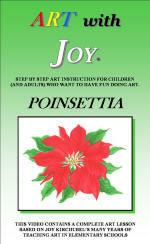 Tells of the Mexican legend of the Poinsettia (a Christmas legend). Students draw and paint a bright, beautiful sunflower using pencils, pens and water colors. Lesson teaches how to paint with water colors; how to hold the brush and paint with the tip of the brush, how much paint to use on the brush and how to control it and how to blend and layer colors. Students use pencils to sketch a standing bear. Students are encouraged to draw a fun outfit on him/her and something for him to hold, for example, the bear might be wearing a soccer outfit and holding a soccer ball. Many examples are shown along with examples of backgrounds should they choose to add one. Students complete their drawing with pens and crayons or colored pencils. Lesson teaches proportion, symmetry and sketching circles and ovals. 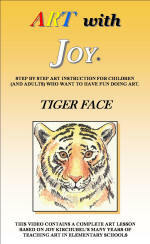 Teaches children how to draw the head and face of a tiger and color it realistically using crayons and fine line markers (of black crayons). Endangered species discussion - tigers, their characteristics and habitats. 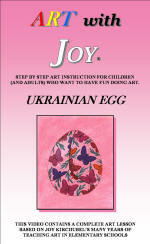 Children design an egg with colored markers on a background created with colored chalk and may use the traditional Ukrainian patterns, symbols and colors which are presented in the lesson. Discussion of the Ukrainian tradition of coloring and giving beautiful eggs to each other at Easter time. Also included is a brief discussion of Faberge’ eggs.